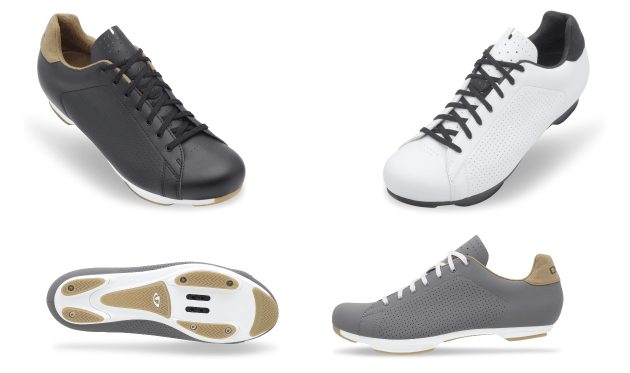 The Giro Republic is a new road shoe that fits in with the company’s New Road range of clothing. While not an out and out racing shoe, it is still a performance item despite looking more like a casual trainer crossed with Taylor Phinney’s Empire shoe. The Giro Republic has a perforated micro-fibre upper, with micro-suede details. A nylon composite outsole with replaceable soft tread sections should mean an end to the cafe skating section of your ride, while still being stiff. And it got laces. Yes, laces. Taylor Phinney wanted them on his Empire shoes that he rode last year, because they reminded him of the football (soccer) boots he wore as a youngster. While they may give Phinney a warm, nostalgic feeling, laces still have a place on modern cycling shoes. One of their major benefits is adjustability allowing the shoe to conform more closely to the riders foot, which helps in power transfer. Another benefit is light weight and robustness. Nothing’s lighter, or simpler than laces and they’re very unlikely to be damaged in a crash. The sole is made from Giro’s DuPont™ Zytel nylon and uses a 2-bolt cleat mount. The Giro Republic comes with a moulded EVA footbed with medium arch support and Aegis anti-microbial treatment, to keep the funk at bay. You can swap this over for one of Giro’s Supernatural footbeds, which come with different amounts of arch support, allowing you to fine tune your shoes fit. Available in 3 colours, white, grey or black and in sizes EUR 39-48, the Republic has a MSRP of $150. Check out the videos below, for a very comprehensive explanation of the thinking and technology behind Giro’s soles and footbeds.